This may seem like an innocent enough comment, but coming from my 5-year-old as he held an empty egg carton…it sounded ominous. “A different looking cat?” I asked. “I’ll go check,” I said as I went out in the bright, noon sunshine and headed toward the coop. “Mommy, be careful!” called my oldest, worry in his eyes. I was halfway to the coop when I saw movement. A few more steps and the “different kind of cat” shot out from under the coop, a chicken in its jaws. A fox had been in the henhouse. Surely, I thought, he had just captured PJ, our one free-range hen. There was no way a fox could actually get in the henhouse. Right? I checked on the smaller flock first. The three ladies looked a little shaken up, but aside from a few loose feathers, they were unharmed. 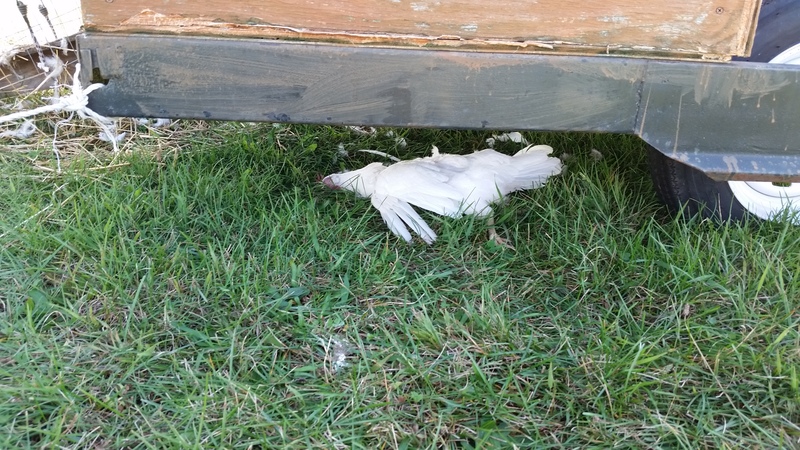 I could see a lifeless chicken under the coop. I could only assume it was PJ. On closer inspection, her head and body were all intact. She looked almost peaceful. But wait…if PJ was in one piece without a leg, thigh or head missing…what did the fox have in its mouth? It was then I heard it. The eerie sound of silence. Not a whisper or a rustle came from the coop. Not a hen wandered in the pen. I slowly opened the laying box and peeked inside. All I could see were feathers. I opened the big door and saw bodies everywhere. It was a feathery massacre. Not one of the Pearl White Leghorns had survived. All bodies, save one, were accounted for. The missing body, I could only assume, was in the belly of the fox. I don’t know if I truly interrupted his theft, or if he was only going to take one bird all along. I’ve read that the fox can get in a “killing frenzy” when cooped up with a bunch of hens, but usually will only leave with one. Creepy. As I started to remove the dead, I noticed something strange. Only two hens were headless. The rest were just…dead. There was no outward sign of fowl play. As I picked the bodies up with my three-layer-gloved hands, I saw what had happened. The fox, had broken all their necks, but only taken one as a prize. The guilt set in as I realized what had really happened. The words I had spoken only the night before echoed in my mind. The wily fox had heard me and granted my wish. 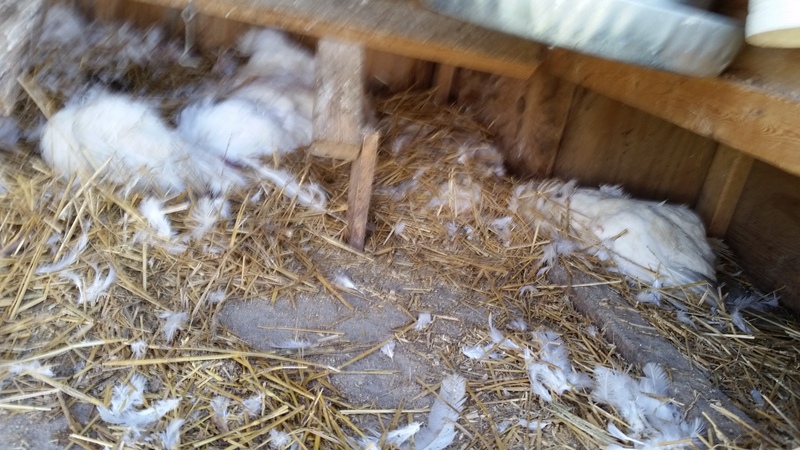 This entry was posted in Adventures in Homesteading, Chickens!, Food, Life, Poetry. Bookmark the permalink. Even PJ. She was under the coop. I’m surprised she didn’t get away. Oh no! How are the kids handling this? You are so brave. They are ok. They understand that is part of living on a farm. Joe wants to get the fox though.